This October marks 20 years since the East and West Germanys were united. German politicians prefer to call it die Wende (‘the turnaround’) since the word ‘reunification’ is politically sensitive and problematic on historical grounds. The celebration coincides with the 200th anniversary of that great swilling of beer – the Oktoberfest – when Bavarians (according to the City of Munich’s Department of Economic Development) quaff a mind-numbing 7 million litres of the brew. The beer is quality stuff, unadulterated thanks to the Reinheitsgebot (‘purity law’) of 1516. The only ingredients allowed are water, hops and barley-malt. My first lapse in a Munich beer hall was before the Berlin wall broke. Hofbräuhaus was celebrating its 400th year. It was everything I’d expected: a cavernous hall with an oompah band and six thousand people shovelling outsized pretzels and sausages. Some had brought their own ornate tankards. Strangers locked arms and sang lustily, rocking on benches. Blonde, buxom waitresses with pigtails and dressed in dirndls, bustled about shouting vorsicht (“caution!”), carrying up to eight giant glass beer mugs at a time. I saw one guffaw good-naturedly when a drunken male patron pinched her plump hams. She didn’t spill a drop. Earlier this year, I returned to Munich’s bacchanalian beer halls. My favourite (for sentimental reasons really) is the Augustiner, originally a monastery. Nothing much had changed, except now more than half the clientele are tourists, while Alpine barmaids are in short supply. Instead, I was served in perfect German by a woman of East Asian and by a man of Indian descent. To get a litre of beer (6.90€) you just ask for “Ein Maß bitte”. The Oktoberfest, which started life as a horserace, is a very Bavarian event, but it has spread to other parts of the world. Expats and their progeny tend to put regional prejudice aside outside the fatherland. The double-storey Paulaner Brauhaus in the V&A Waterfront is more tourist magnet than trap. They have a loyal local following and offer party kegs of beer (up to 30 litres in size) by prior arrangement. Two impressive, giant copper beer kettles stand at the rear of the bar counter; you can see steam escaping every now and again. A malt mill is visible behind glass. The beer is made on site under brewmaster Wolfgang Ködel. He is brewing up a special batch of 6000 litres of dark amber-coloured beer for Oktoberfest, which runs here in Africa until the end of the month. The oompah Songscape Bierfest Band and KeeZee, a German-born female singer, will entertain the crowds. The 450-seater outdoor beer garden is partially covered by a Bedouin tent. The menu is Bavarian and I can highly recommend all their signature dishes. The crusty, dark crumbed pork schnitzel (R95) is moist and scrumptious inside. It comes with chips, but try ordering it with their traditional-style potato salad (kartoffelsalat) prepared with vinegar, rather than mayonnaise. If you’re very hungry, then you can’t go wrong ordering the crispy, enormous roast pork knuckle (R105). Naturally, they offer a range of sausages (Germans apparently eat 30kg of sausage per person per annum). The nine grilled ‘Nürnberg-style’ sausages (R95) arrive in a pan with mash, mustard and a flavourful sauerkraut fermented to just the right tartness, rich in apple and not too sour. A little-known fact is that Captain James Cook considered sauerkraut one of the secrets to his success on his long voyages. Also celebrating is Dinkel, the charming German bakery conveniently close to Cape Town’s German school. Under the new ownership of Brigitte Pack and her husband Gerhard, they officially launch with Oktoberfest specials. The bakery takes its name from the German word for spelt. Spelt, also called German wheat, has been grown at least since 4000BC. It is noted for its high protein and moderate gluten content. Dinkel make a 100% dinkel bread. It is light, nutty and tasty, and amorous of olive oil. They use only stone-ground flours and organic produce. Among the many baked attractions are sauerkraut bread, Blackforest rye and salty pretzels. In numerous ways, I feel the Germans have it right. In the beer halls, you get excellent fare and lots of it at a sensible price. There’s something very democratic about their delicious, wholesome and large food, and about beer in general. Paulaner Bräuhaus, Clock Tower Precinct, V & A Waterfront, Cape Town. Tel: 021 418 9999. Dinkel, 91 Kloofnek Road, Tamboerskloof, Cape Town. Tel: 021 424 3217. Augustiner Großgaststätte, Neuhausenerstr 27, Munich, Germany. Tel: 089 231 83257. Hofbrauhaus, Am Platzl 9, Munich, Germany. Tel: 089 290 1360. This article appeared in the Mail & Guardian October 15, 2010. As the old adage goes it takes a foreigner to show one the beauty of your own town. Although I have lived in Cape Town most of my life, I was unaware that visitors could climb right up into the lantern room of the Mouille Point lighthouse. A landmark heritage building in red and white candy stripes that has saved and guided countless ships from as far back as 1824, everyone I know calls it the Mouille Point lighthouse. In fact, it is the Green Point lighthouse. Its misnomer stood a hundred meters further away before it was destroyed. The etymology of Mouille is contested too. Old Dutch has ‘moeilje’ for breakwater. The origin seems likely to be from the French military, the verb mouiller employed when casting anchor or from the past participial for “wetted”. Other sources claim the name comes from the tribes known as the Hottentots and Strandlopers who called the land Kai Haa Mullai. Whatever the origins, almost up and until the millennium, the Mouille Point residential strip was considered second-rate. Residents complained about the regular pea-soup mists and the foghorn (upgraded in 1986) that blared at all hours of night. Not that long ago, even student friends could afford to rent ramshackle flats here. Then the big property developers moved in, buying up the last city seafront lots, knocking down many of the old blocks and building luxury apartments, more than half of which seem to stand empty all year except for a few summer months. In the 1960s and 70s, the Doll’s House drive-in roadhouse served hamburgers and hotdogs to people in their cars. Patrons had to compete with brazen flocks of scavenging seagulls. There are today a number of smarter eateries taking in the view besides that old survivor Theo’s Grill, which opened in the 1980s. 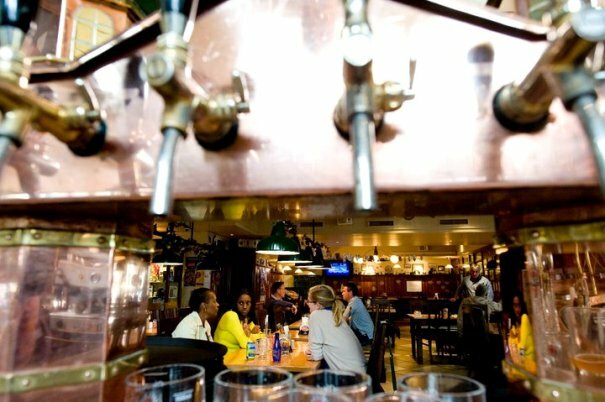 You’ll find deli cafés such as Café Neo, the Sundance Gourmet Coffee Company and the Newport Deli; boutique restaurants like Café Splendida; large, watering holes and hangouts trying to be trendy, including Pepenero Italian seafood restaurant, Wafu and Wakame. Now an enterprising Berliner, Andrej Brandt, has set up a mobile pizzeria, Prima on wheels, at the lighthouse. It was he who first made me aware of the small museum inside. 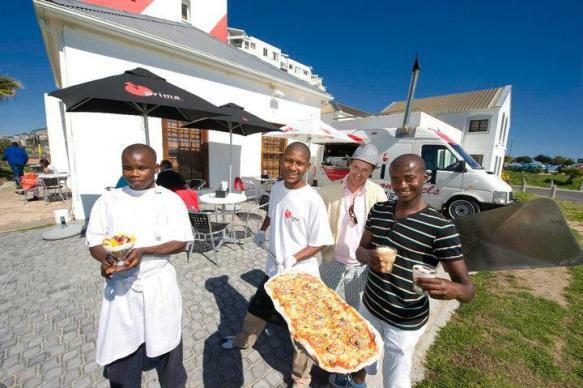 ¬¬Out of his Volkswagen LT35 panel van, which incredibly has a built-in wood-fired pizza oven, Andrej and his team of baristas, Malwandi Notyena, Thando Mini and Thando (Tito) Luakhe Peter, serve pizzas, excellent coffees, espressos and cappuccinos, freshly squeezed juices and some fine desserts. His pizza dough is made only with stone-ground Eureka flour. Options include tuna with onions; salami and green pepper and margaritas for vegetarians. His Parma ham and rucola pizza is a winner, as is the Norwegian salmon (fresh on top, not grilled) with capers, mayonnaise, a dot of raspberry jam and a little red onion. Ever since he started up in June, when most of his clients were the scores of police deployed for the FIFA World Cup, locals have taken to the hardworking and talkative Brandt with enthusiasm. On a summery day, the public spread themselves out on the lawns, chatting, reading and relaxing to the sound of the sea. A photographer by profession, Brandt worked in the film industry for many years. He first came to South Africa in 1996 and loved the country. “Once here, you never get away anymore”, he says. His wife is director of Boss Models Cape Town. They hand-built a guesthouse in Yzerfontein, the Light House, a fetching American-style clapperboard beach home. Brandt’s food stall is a big hit with the many dog-walkers on the esplanade. With typical Berliner verve, he provides bowls of water for thirsty mutts, and even makes his own special organic dog food. It is so good, humans can eat it too, he says. Some locals have become quite agitated when Brandt skips a day or two in inclement weather. But not everybody is pleased with this civilized state of affairs. Brandt, who rents his premises from the lighthouse, says Councillor JP Smith, he of the vice squad and Chair of the Safety and Security Portfolio Committee of the city, turned up with a dozen police to evict Brandt, claiming there is a zoning issue. Brandt says, laughing, that Smith backed up these claims with maps printed from Google Earth on which he had drawn borders. He was unsuccessful. Here’s hoping that long may people and their pooches be allowed to enjoy a cup of coffee and a bowl of water or a slice of pizza when out for their promenade. Prima on wheels. Green Point lighthouse. Tel: 083 299 0500. The Green Point Lighthouse Museum. 100 Beach Road. Entrance costs R16.